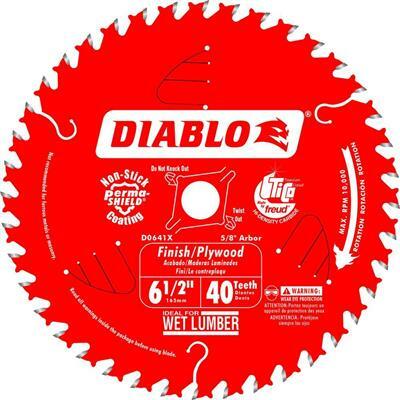 Constructed with TiCo Hi-Density special-blend carbide, this Freud D0641A 6-1/2 in. x 40-Tooth Finish/Plywood Saw Blade is outfitted with 40 teeth to make smooth, finely finished cuts in plywood. The Perma-SHIELD nonstick coating reduces drag while stabilizer vents absorb noise and vibration to keep the blade straight. An ultra-slim kerf produces a thin swath for less material removal and fast, effortless operation in dry or wet lumber.